Last month, BBC published a news article about blockchain titled “How do you know where your olive oil really comes from?” Welcome to blockchain in supply chain. The news article detailed rampant fraud in the olive oil industry and how most of the what the products show on their labels are misleading. It cited a PwC report that said nearly 40 percent of the food companies believe that the traditional methods of fighting fraud are not working. The Italian olive oil maker, Belluci, is using blockchain (in partnership with Oracle) to secure the record of the product’s long journey from the farms to the market. Belluci is not alone. IBM became one of the first users of blockchain in supply chain when it signed up with Walmart to use a blockchain-based system for vegetables and fruits in 2017. These are not just pilot projects but already in production. IBM’s HyperLedger Fabric, which is the main blockchain platform, listed five such projects in production in November 2018. They range from use cases in vegetables to coffee to airlines to e-commerce to insurance. In a sign that such projects are gaining wider recognition, The New York Times also reported on Walmart’s efforts to use blockchain to fight contamination in food products. It is part of IBM’s collaboration (as part of its Food Trust Network) with key food producers and distributors including Dole, Golden State Foods, Kroger, McCormick and Company, Nestlé, Tyson Foods, Unilever, and Walmart to reduce contamination in the global food supply chain. In 2017, IBM has also announced a “Blockchain Food Safety Alliance” to improve food tracking and safety in China with Chinese online retailer Nasdaq-listed JD.com, also in partnership with Walmart. By the end of 2019, the American retailing giant expects as many as 100 farms that supply Walmart with green vegetables to put information about food into a blockchain database. It has previously done several proof-of-concepts with sliced mangos and with pork in China and imported animal protein. As Frank Yiannas, the head of blockchain at IBM told Computer World magazine, the company has since moved into production. Walmart is not alone in its experiments with blockchain in food supply chain. Chinese e-commerce giants Alibaba’s B2C unit Tmall International is using blockchain to verify the provenance of dairy products from New Zealand and Australia, notably New Zealand’s largest dairy farm Ammum. Tmall is also reportedly testing a blockchain platform known as “Full Link Traceability System” to increase transparency of imported fashion goods. By the way, Alibaba is the most patented company in the world in terms of blockchain technology. On the 406 patent applications related to blockchain in 2017, Alibaba had 43, second only to the People’s Bank of China which filed 68. While today’s supply chains are fairly mature, there are a few opportunities where blockchain-based solutions help significantly (notably in the food industry). Modern supply chains are quite complex with two or three tiers of suppliers and multiple tiers of distribution channels. The workflows between these institutions are inherently highly transactional with little visibility beyond the immediate level of relationship. This creates an opportunity for a blockchain-based application to provide trusted transparency and visibility in the supply chain. He compares it to FedEx tracking and how each point of journey from farm to the food is traced and recorded on blockchain. After having recorded all of the information, blockchain does is that it allows one to trace the food back to its source very quickly in seconds, not days or weeks. This is particularly useful in the event of foodborne disease outbreaks. As with the case of Olive oil and dairy products, managing today’s supply chains—all the links to creating and distributing goods—is extraordinarily complex. Depending on the product, the supply chain can span over hundreds of stages, multiple geographical (international) locations, a multitude of invoices and payments, have several individuals and entities involved, and extend over months of time. Due to the complexity and lack of transparency of the current supply chains, the interest in using blockchains to help transform the supply chain and logistics industry is not surprising. Since manufacturing has been globalized, it’s also incredibly difficult for customers or buyers to truly know the value of products because there is a significant lack of transparency in the current system. In a similar way, it’s extremely difficult to investigate supply chains when there is suspicion of illegal or unethical practices or in the event of contamination. They can also be highly inefficient as vendors and suppliers try to quickly connect the dots on who needs what, when and how. 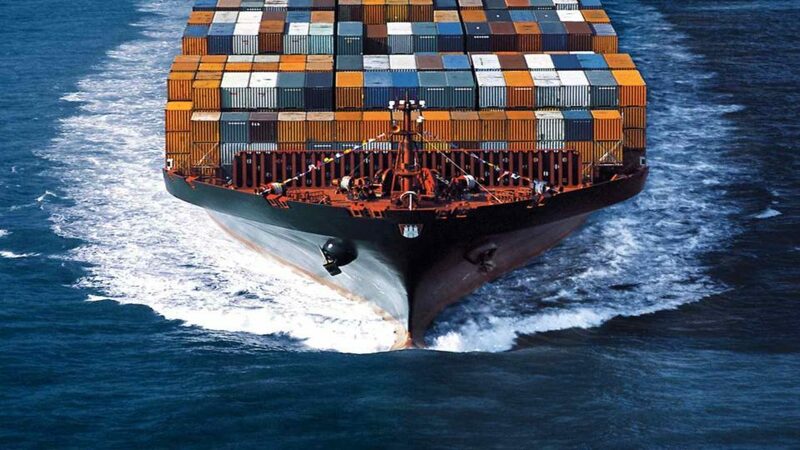 Last year, international shipping giant Maersk joined forces with IBM and 94 other organizations to form an industry-wide blockchain-based trading platform. The purpose is to provide the customer with end-to-end supply chain solutions, including freight forwarding and trade finance. While still in its infancy, the platform, named TradeLens, aims to digitize the supply chain, with a focus on the $3.2 trillion ocean-shipping industry market. Direct trade organic coffee seller Cambio Coffee provides a clear, traceable supply chain path for its products–from harvesting to roasting, packaging, and shipping–so customers could learn the exact details of what they are buying and drinking. To do that, the company began adding QR scan codes from ScanTrust to its coffee packaging, which when scanned records those details onto a Hyperledger Sawtooth blockchain network. Tying the QR codes together with the blockchain data lets coffee buyers scan the codes to see exactly where their coffee originated and how it arrived to their local store and into their grocery carts. The idea, according to Cambio Coffee, was to give its customers trust in its products and to provide transparency and traceability throughout their journey to customers. Last year, Canada-based Emerald Health Therapeutics, Inc. and DMG Blockchain Solutions Inc. formed CannaChain Technologies to develop a blockchain-based supply chain management system and e-commerce marketplace for the legal cannabis industry. This new multibillion-dollar industry depends on verification at every step, from field to sale, making this sector a perfect candidate for blockchain technology. Total transparency, which is required to prove products’ authenticity and compliance, can now be achieved with ease. MediLedger, a joint venture by Pfizer and Genentech, was launched in 2017 with the vision of providing “an open and decentralized network for the pharmaceutical supply chain.” The goal is to provide compliance and trace regulations, ensure the security of the drug supply and patient safety, allow for simplified payment processes, and serve as a platform for bringing about overall business transformation. This system could allow for the transfer of serial-number ownership, for example, between a manufacturer and a wholesaler while enforcing smart contract rules. Marc Watrous, senior vice president of managed care and customer operations at Genentech, said that a proof of concept had been completed, and that the project should be operational by 2023. The team working on the project was able to fully encrypt all transaction information and ensure that no confidential information was shared in the process. The test also proved that users could validate a medicine’s origin and serial number transfer using the blockchain-based system. Once operational, MediLedger’s platform will offer the transparency, safety, and traceability that are so difficult to prove in today’s global pharmaceutical market. In March last year, De Beers announced that it had tracked 100 high-value diamonds from miner to retailer using blockchain, to ensure that the proceeds were not used to finance violence and terrorism. Five diamond manufacturers Diacore, Diarough, KGK Group, Rosy Blue NV and Venus Jewel worked on the trial project, which was launched in January 2018, and is expected to be made available for the rest of the industry in the latter part of the year. The chief executive of De Beers Bruce Cleaver said that the project has “demonstrated that it can successfully track a diamond through the value chain, providing asset-traceability assurance in a way that was not possible before.” An immutable and secure digital trail was created for a selection of rough diamonds mined by De Beers as they moved from the mine to cutter and polisher, then through to a jeweller, De Beers said in a statement. There have been new developments recently. Take, for example, recent announcement by Maersk to partner with Indian tech startups under its OceanPro accelerator program launched in October 2018. It is planning to leverage the benefits of blockchain, the Internet of Things (IoT), advanced analytics, and artificial intelligence on a larger scale for end-to-end logistics. These firms include Zasti (AI), iNatrix (machine learning), MintM (computer vision), KrypC (blockchain) Linkeddots (IoT), La Vela Pictures (virtual reality), amongst others. Evidently, blockchain is now being used on a global scale across industries of all kinds, allowing for trusted and secure transactions among all supply chain partners. And with the technology gaining traction every day, it looks as though it will continue to transform the future of logistics. A question that is commonly asked is: Can blockchain really deliver on its promise, or is it just a glorified database as critics have claimed? Lack of Standardization: One obstacle is technical capacity, such as the availability of knowledgeable personnel and decentralized record keeping. In addition, the widespread distribution of information through blockchain can in some instances have competitive implications for parties in a supply chain, so they may be reluctant to share some data. Moreover, lack of standardization in documentation among supply chains can lead to higher administrative and governance costs and increased risk of incorrect data entry. Risk of Corruption: Finally, the effectiveness of supply chain compliance audits often turns on the accuracy of certifications provided by suppliers and subcontractors, who may be unwilling to give a candid account of the provenance of raw materials or unaware that they should. They might also hesitate to estimate the likelihood that illicit activities have caused vulnerabilities in the supply chain. However, as long as a good’s initial point of entry into the blockchain is carefully vetted and authenticated—for example, the cobalt has been certified as non-conflict before being added to the blockchain—any later attempt to fraudulently alter the blockchain would be orders of magnitude more difficult than tampering with a traditional database. Risks notwithstanding, the industry is attracting huge investments and that presents opportunities for investors. Technologists believe blockchain can increase the efficiency, speed and transparency of supply chains and positively impact everything from warehousing to delivery to payment. Chain of command is essential for many things, and blockchain has the chain of command built in. Blockchain provides consensus—there is no dispute in the chain regarding transactions because all entities on the chain have the same version of the ledger. According to estimates, blockchain could help reduce the cost of resolving disputes by 30%-50%—all of which can significantly save business costs. According to a recent report from ABI Research, demand for blockchain will push revenues for the technology to $10.6 billion by 2023.